Fall is one of the most popular times of the year for weddings and also one of the most gorgeous! 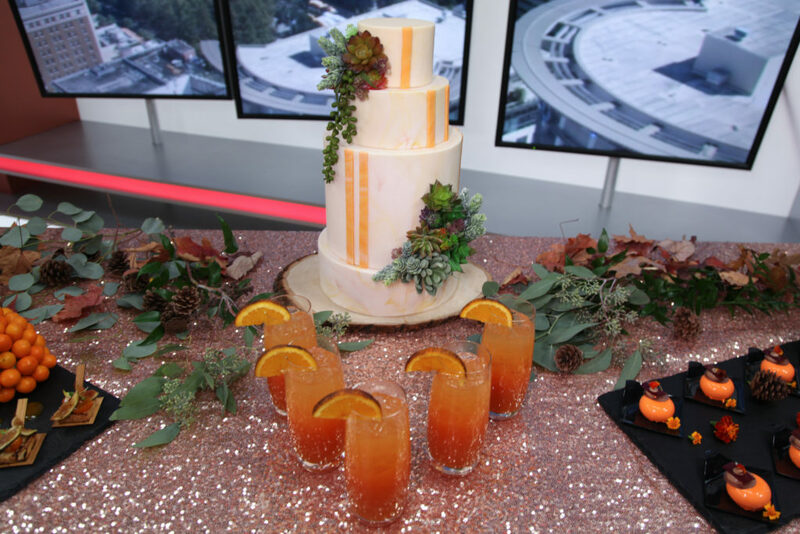 Couples are planning events that speak to their style by incorporating color, customized elements and how they like to entertain. 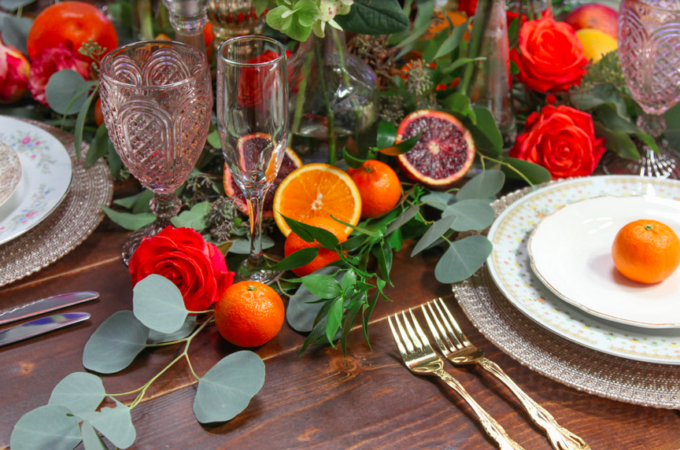 Be on the lookout for weddings to feature a chic twist on tradition this season. 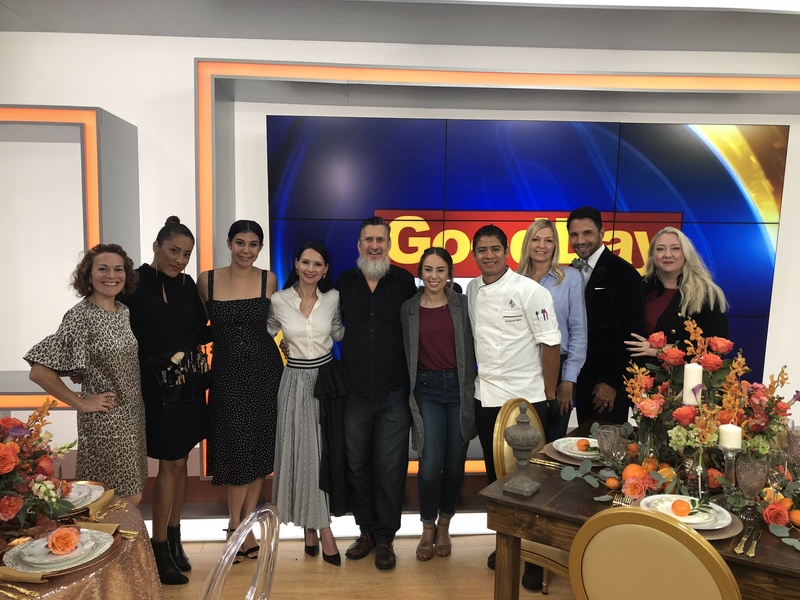 Here are the top ten Fall Wedding Trends for 2018. Bright orange isn’t just for Summer it’s now trending for Fall! 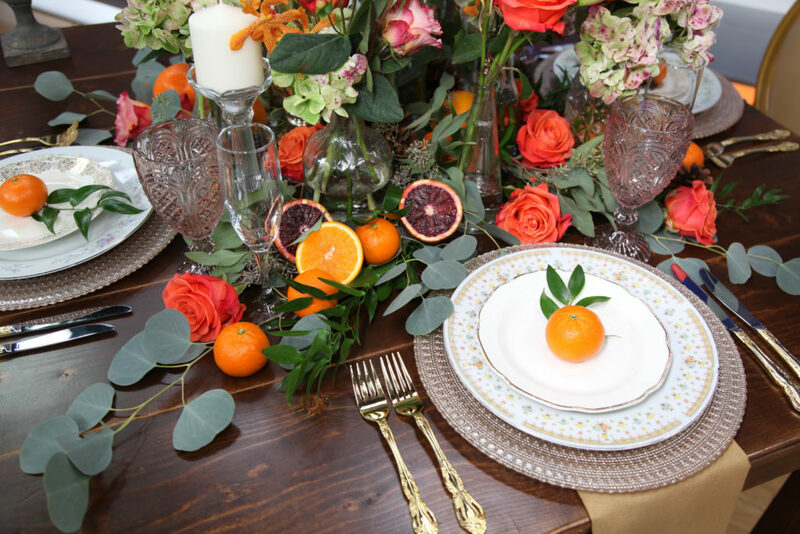 Bright orange and bold jewel tones are definitely in this season as couples are adding more color into their wedding designs. I’m thrilled to see more color following a few years of blush pink and neutrals ruling the designs. 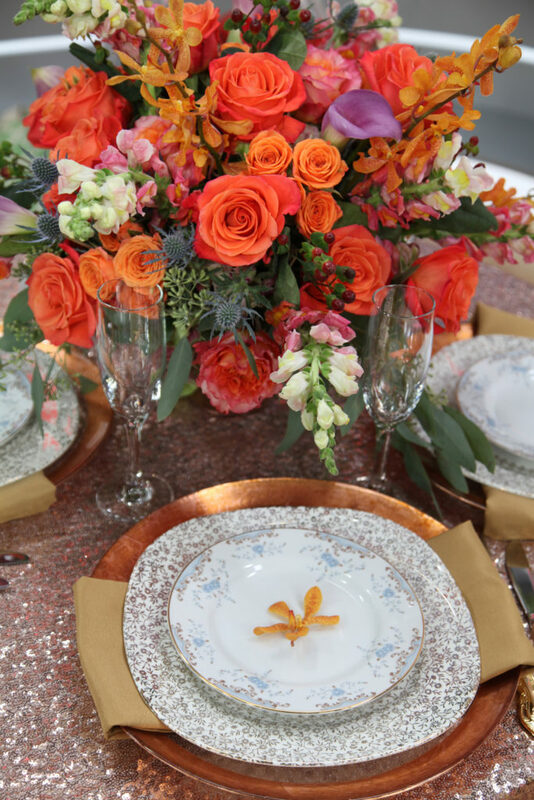 Bright orange or bold colors can be incorporated into invitations, flowers, linen colors and makeup to set the tone and mood of your wedding. Don’t worry if you are still in love with the blush pink trend, you can absolutely still use it as a gorgeous foundation color and add your pop of orange to the look as an accent like in the photo above. Step away from the mason jars and twine! Instead incorporate fresh fruit–like citrus in rich hues or deeper toned figs, pomegranates and grapes into your overall table to bring some of the richness of the season to your design. 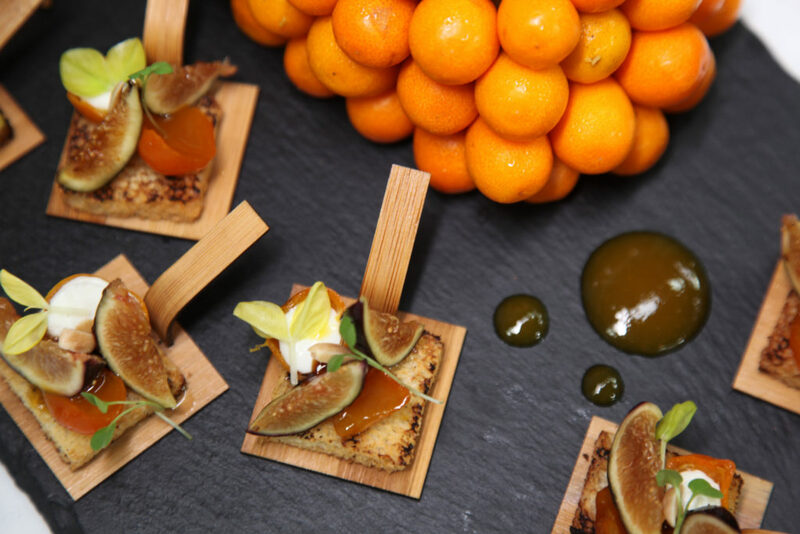 *Pro tip: incorporate those same fruits into your locally-sourced menu for your wedding reception or after-party to give your guests a multi sensory, seasonal experience. Glamour is still in but we are seeing a shift from the over the top Gatsby look we have been seeing in the last few years back to a more polished and sophisticated Old Hollywood glamour. Think the Max Factor era of Hollywood in the 40’s of sleek lines and standout design moments. 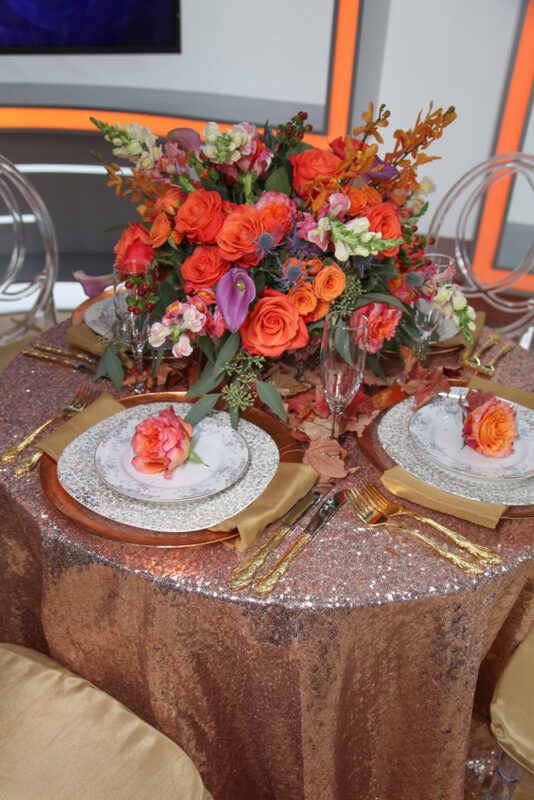 I am obsessed with this beautiful blush sequin linen layered with antique china and gold silverware accented with a romantic centerpiece of bright roses and wispy blooms. 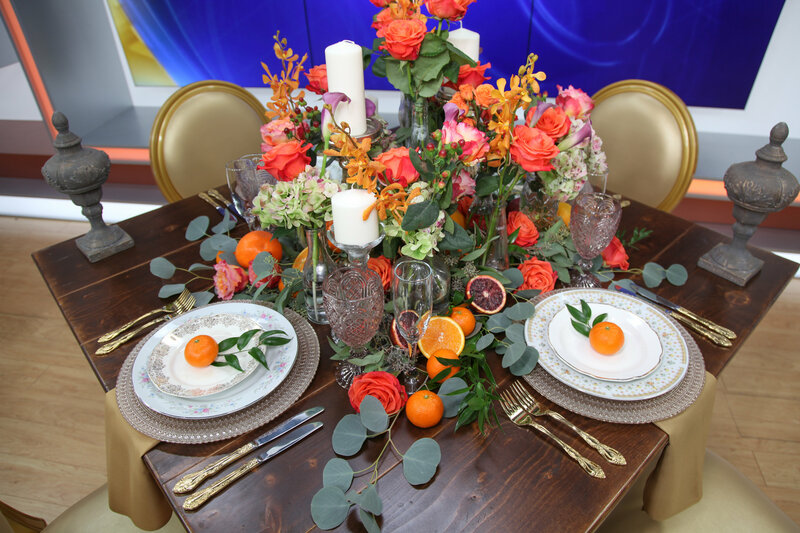 Wooden Farm Tables, Garland and Fresh Fruit Accents are taking the rustic look into modern glam this season. Cozy wooden banquet tables are understated and elegant in all the right ways so scratch the tablecloth and go for a monochromatic look that shows off the beauty of the natural wood tables and feels more modern than it does rustic. One of my favorite elements for this season is mismatched antique china. I actually love with elements on the table don’t match exactly. I think it gives the table more depth and interest than matchy-matchy. 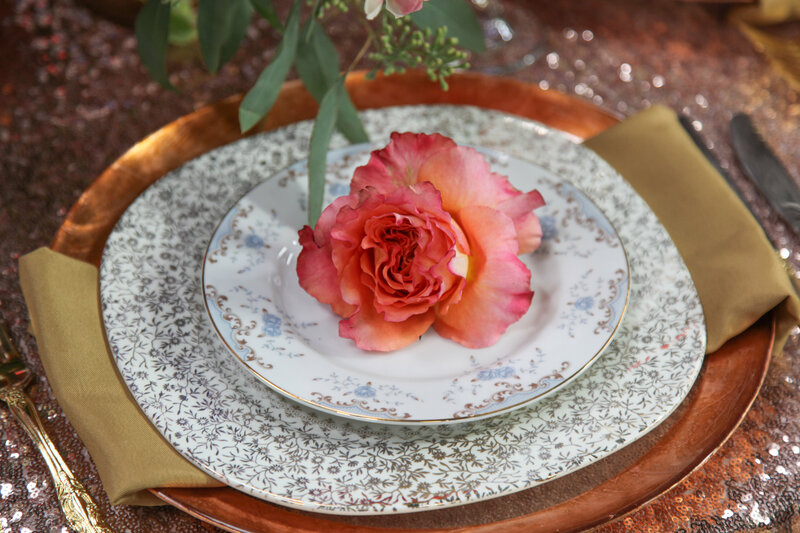 So select mismatched antique china to elevate your table with some elegant charm. Add gold or copper flatware to add a touch of metallic shine and warmth to play off the colors of the Fall season. The runways have been full of stunning bridal gowns with minimal detail and design. What makes these designs so gorgeous how it’s constructed. 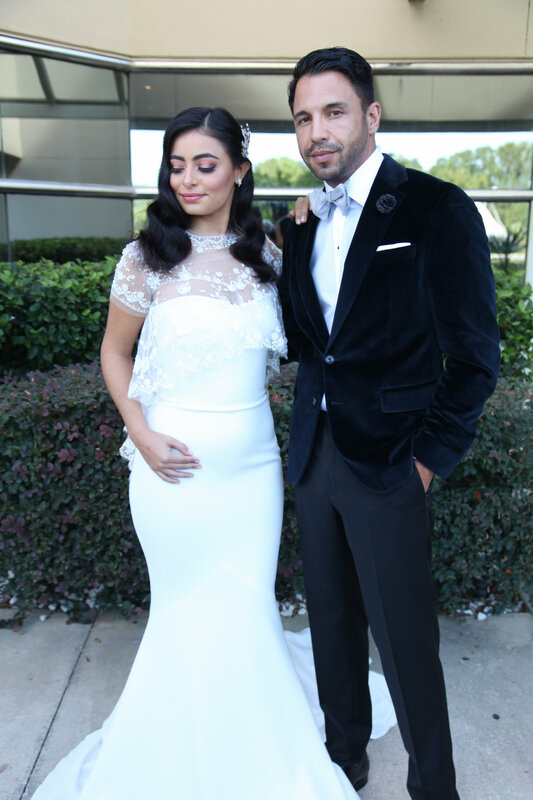 The beauty lies in the lines and fit of the dress since it doesn’t have the embellishments of lace and beading to rely on (think Meghan Markle’s gown). Add a touch of Old Hollywood with hair and makeup and you have a showstopping look the minimalist, uptown sophisticate, and glamorous starlet will absolutely love. 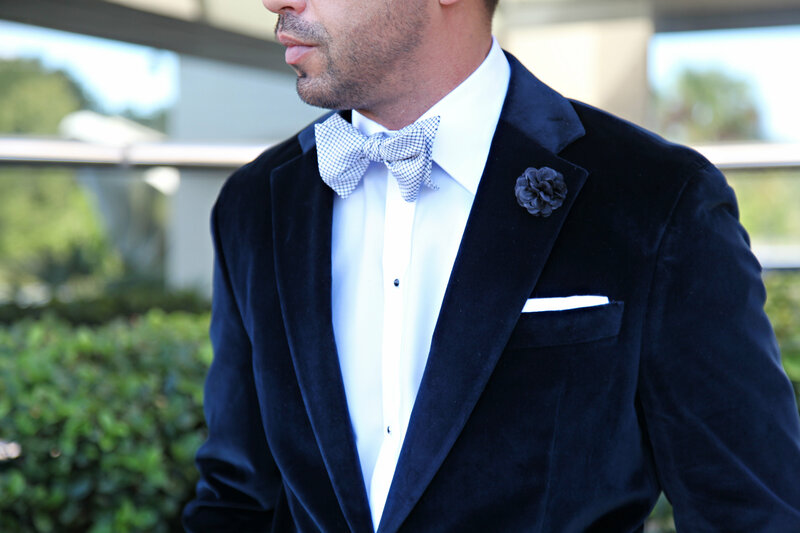 For the last year we’ve been seeing a revival of velvet tux jackets on the red carpets and I for one am all for it! I think it’s chic and elegant – very Old Hollywood leading man. Fall is the perfect time to embrace this trend with a rich color like Navy. Pair it with a black and white checked bowtie, white pocket square and crisp white shirt for a modern look. I love this look! 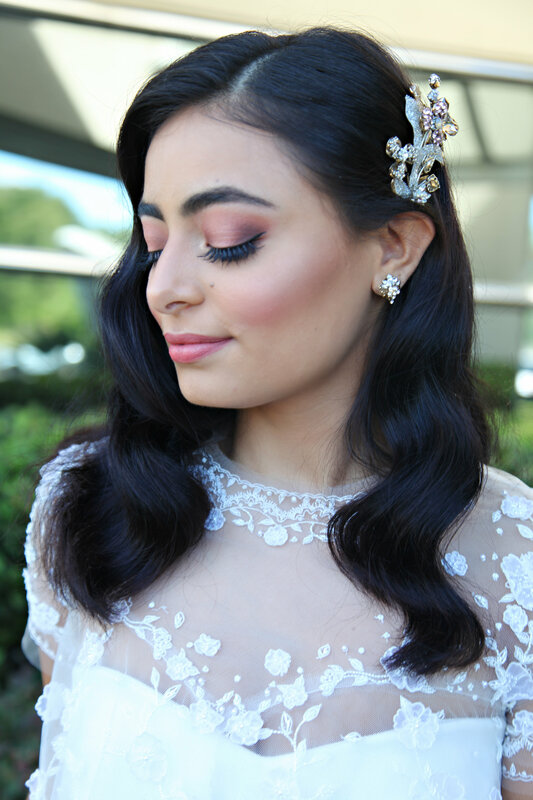 Glam Old Hollywood Hair Meets Rich Sienna and Metallic Makeup for the Fall Season. 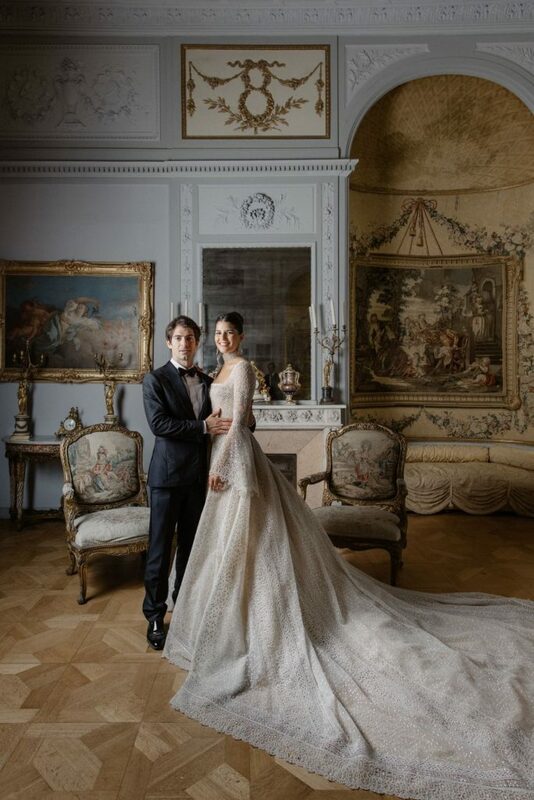 Take a page out of the Royals’ wedding handbook and capture some photographs in the parlor or ballroom of your venue with notable architecture and mid-century decor will naturally make for elegant, picturesque portraits you’ll treasure forever. 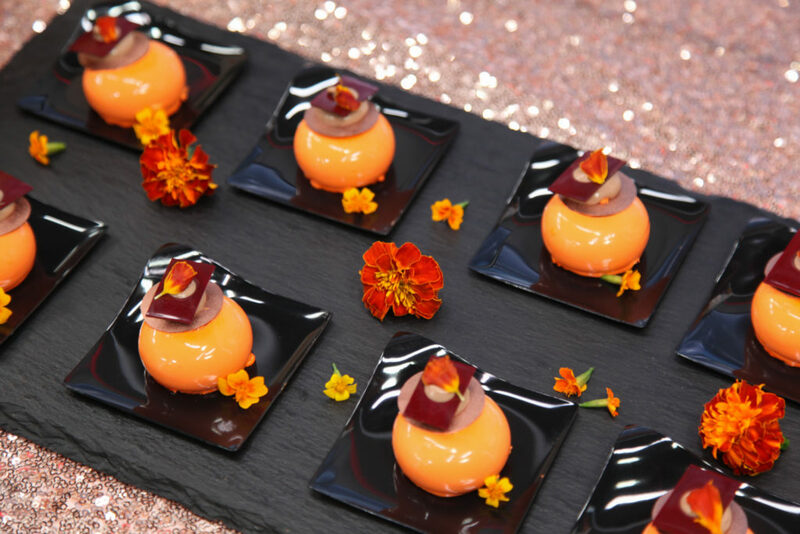 Create a locally-sourced menu for your wedding reception or after-party to give guests a multi-sensory, seasonal experience by incorporating rich flavors into small bites, decadent desserts and craft cocktails. A white chocolate cheesecake with an amaretti cookie “pie” crust, covered in a salted caramel sauce and filled with roasted granny smith apple filling with clove, anise and cinnamon to bring all the favorite flavors of the season into one Fall experiential bite. Have wedding questions? Ask them in the comments below and I’ll be happy to help however I can!